Position a broiler rack about 6 inches from the source of heat and preheat the broiler. Meanwhile, brush the salmon on both sides with the oil, sprinkle with the tarragon, and season with salt and pepper. Oil the broiler rack. Broil the fish, skin sides up, for 3 minutes. Turn and continue broiling until the fish is opaque in the center with a tinge of rose color when prodded with the tip of a sharp knife, about 5 minutes more for medium-rare salmon. Place each salmon fillet on a dinner plate. Add the remaining 2 tablespoons chilled butter, cut into bits, to the vegetables. Stir with a wooden spoon, being careful not to break up the vegetables, to melt the butter. Season the ragout with salt and pepper. 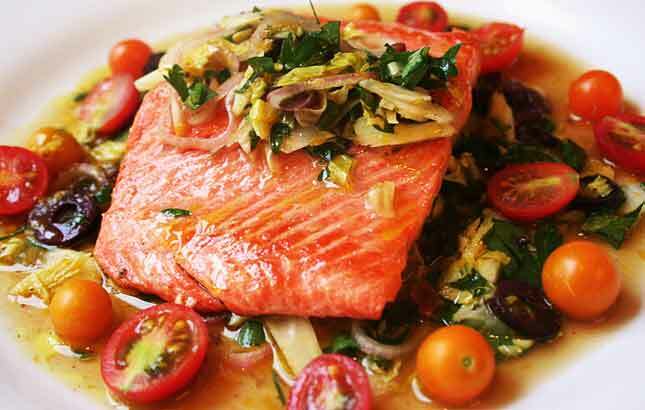 Spoon the ragout over the salmon and serve immediately. looks good. never divided the butter before though. i’m thinking about doing another cedar planked salmon on the grill.